Frida Kahlo has been a iconic figurehead in the world of art for many years. What make’s Frida so desirable, is her openness in her art. While a lot of artists, (Like her husband Diego Rivera) were focussing on political statements at the time, Frida was producing vey raw and personal pieces. The anguish suffered is so clearly communicated in her work. This is what hooked society of her time, and still hooks society today. During this new series, we will take a look at the personal and private spaces of some of the worlds most valued artists. We have started with Frida because she was such an open book, and her home is something that intrigues visitors to this day. 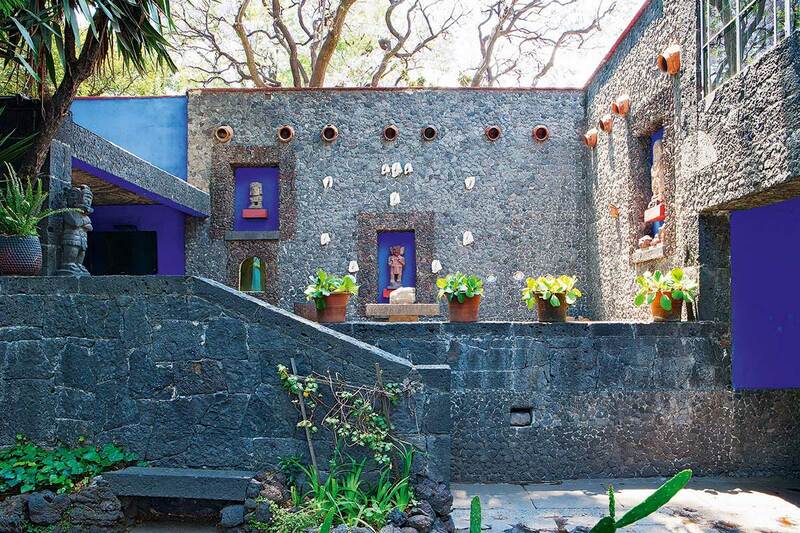 Kahlo was born in and died in her much loved home, Casa Azul. Known as Blue House, the home is now a public museum in Mexico City. As one of the most popular stops on any pilgrimage to the city, its best to arrive early to avoid crowds. 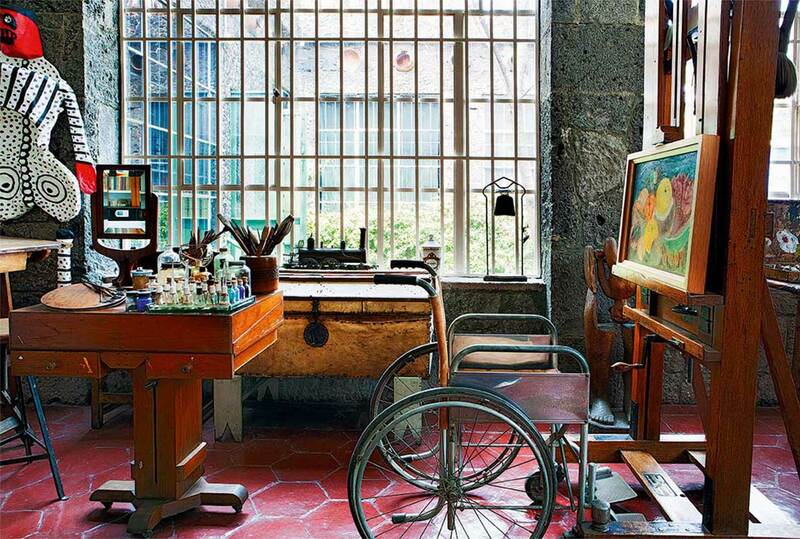 Built by her beloved father, Guillermo Kahlo, the house is filled with the personal belongings of not only Frida and Diego, but also her father, mother and sister. Everything from make up, clothing, kitchen pots and pans have been left in the same place since their last use. This is especially true within Frida’s studio, where paint and brushes have not been touched since her death. Frida’s Studio, Photo: Soured, Yellowtrace. But Frida’s identity isn’t only displaced through the objects left. The structure itself exudes the essence of the artist. The house stands out from others due to the cobalt-blue walls. Hence the name, Casa Azul or Blue House. Designed around a main garden courtyard, the house originally featured French decorative features. It has since been changed however, to feature the plainer facade seen nowadays. Enclosed now by four sides, the house covers over 800m2 and two storeys. Kahlo and her husband lived in the upper floor, while guests milled around using the ground floor. It was actually Rivera whom construction the new wing which closed off the home to the street. 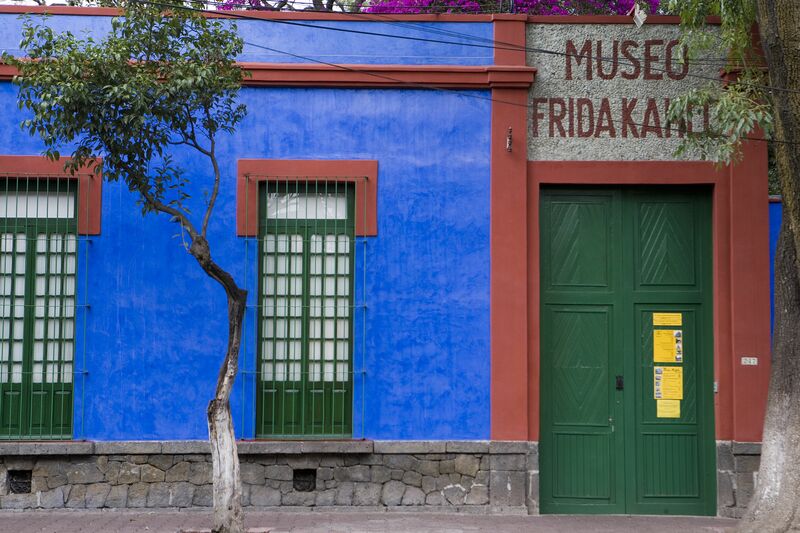 In this new wing, Frida’s bedroom and studio now lived. The new addition of a terrace roof was decorated with marine shells and built from local volcanic rocks with ceramic vases set in. It is during this time or renovation that the French elements were discarded for a more traditional taste. Due to Frida’s medical issues, she taught her students in classes held in the home. The students, who dwindled down to a core four, worked and studied in the patio area. It was during this time of education that Frida painted some of her most iconic pieces of art, which can still be seen today at the house. Frida sadly passed away in her home on 13 July 1954 at the young age of 47. The wake and memorial was held on the property before she was taken to be cremated. Four years after her death, her widowed husband donated the house to Mexico and a foundation of preservation was set up. The home has gone through restoration works, and these works are also focused on preserving the artefacts and paintings left behind. The house hosts over 200,000 visitors a month and is Mexico City’s number one museum. The home is the manifestation of a individual, strong Latin American female artist. It embodies a cult icon and gives followers a rare glimpse into the life of this woman in pain. It is a great opportunity for lovers of art and architecture to experience something special. Stayed tuned for future artist and architecture posts. Please get in contact today if you would like to chat about your future iconic project!